In 1915, the Ottoman Empire decided to make a scapegoat of its Armenian subjects. It declared all Armenians to be subversive and began “relocating” them to the deserts of Syria. Those who did not die on the way from starvation or mistreatment starved to death upon arrival. In this way, the Turks rid themselves of 1.5 million Armenians, a fact the Turkish government still denies. In the shadow of the mountain named Musa Dagh, the inhabitants of seven villages decided not to go. After the villages received the news that they would soon be relocated, they sneaked supplies and livestock up into the mountain. Then, the day before the evacuation, they walked up onto Musa Dagh. There, for forty days, they managed to defeat the Turkish army’s attacks until they were rescued by the French navy. Although there were casualties, more than five thousand people were rescued. 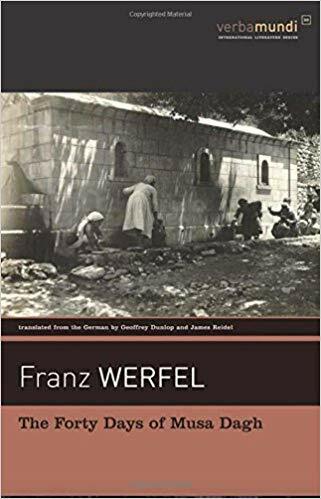 The Forty Days of Musa Dagh is considered Franz Werfel’s masterpiece—his fictional account of the event. The main character is Gabriel Bagradian, a wealthy man raised in Europe who has recently returned to this family home after the death of his older brother. He is a reserve army officer, and when he reports to the regional capital to find out why he hasn’t been called up, he hears disquieting rumors. Back home, he consults with village leaders until the arrival of Aram Tomasian, a Protestant pastor who was relocated with his family from another village. He and his family have been allowed to travel to his father’s village, the authorities thinking it will not affect his fate. But he is able to tell the villagers what is happening during the relocations. Gabriel has been trying to save his French wife, Juliette, and his son, Stephan. But now he proposes that the villagers ascend Musa Dagh and defend themselves. Only the followers of one church decide to cooperate with the Turks. At 800+ pages, this novel is very long, but completely absorbing. Werfel’s characters are not heroes but complex people. The novel is suspenseful because even though we know the result for the village as a whole, we don’t know what will happen to the individual characters. The villagers have deserters, loss of their livestock, a fire in their grainery, and other hazards to navigate. I don’t know any other way to explain it but to say this. This novel is fantastic. It is absolutely what I look for in a good novel, where I can immerse myself in another world for a short while. P. S. If you are interested in reading more about the Armenian genocide, another touching novel is Birds Without Wings by Louis de Bernières. Rachel Shepherd has recently lost the child she was expecting. Her husband, Mick, expects her to grieve for a month and then get over it, but she cannot. She thinks a lot about her father, Henry Shepherd, who disappeared from her life when she was seven. Her mother has also recently died, and in her things, Rachel finds a newspaper clipping of a young African-American girl in church during a sermon by Martin Luther King, Jr., the photo taken by her father as a young man. Rachel figures this photo must have been important to her father and decides to try to find her father through this girl, now presumably an older woman. However, the woman does not answer her emails. That woman is Lillian Carlson, who now lives in Rwanda. Henry had been living with her until two years ago, when he also disappeared from there. She does not feel that she can tell Rachel anything helpful, which is why she hasn’t responded. Lillian provides a home for children orphaned during the Rwandan genocide. Tucker, an American doctor, has a room in her house, where he also keeps Rose, his adopted Rwandan daughter. Tucker decides it could be good for both Lillian and Rachel if they met, so he invites Rachel to come in Lillian’s name. 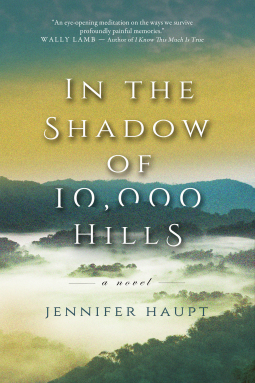 The core of this novel is devoted to the events of the Rwandan genocide and their continuing ramifications, during the time this novel is set (2000), for Lillian and her household. In particular, Nadine, a girl taken in by Lillian and Henry, was the witness of a horrific event. I didn’t really engage with this novel, but I’m not sure why. I do know of one thing that particularly irked me, and that was the sections from Henry’s point of view. First, although they show his thoughts, they are written more in a speaking style, a style no one would use in thinking. For example, a rough such recollection (not a direct quote) of one thought was something like Gee, what does a guy have to do . . . . You see what I mean, utterly unconvincing. And in general there is the type of person Henry is. For most of the novel, he just sort of lets fate push him around, and when he takes an action, he refuses to deal with its ramifications. He most often doesn’t take responsibility. Since a great deal of this novel revolves around the results of his actions, I found this infuriating. Finally, I think the characters in general are too prone to be one-sided. Take, for example, Mick. He gives Rachel a deadline for grieving for her child. He has to spend every holiday with his parents. He won’t compromise. He’s not bad, really, but it’s clear from the beginning that he and Rachel will split, so he shows no qualities that would make her want to stay. These are characters serving the plot rather than ones who are convincingly complex.